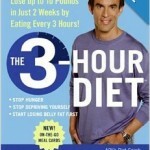 What is new about Jorge Cruise’s 3-Hour Diet program is that it’s focused on the WHEN of eating. Jorge Cruise explains that 3 is the magic hour. I have to struggle with that a little as I am usually feeling the hunger pangs after 2 hours. I am feeling hungry now as I am writing this; and it’s only 2 hours after my lunch at 12.30pm. I am only supposed to be having a snack at 3.30pm, according to Jorge’s plan. Maybe I should up my intake for lunch. By eating every 3 hours, you force your body to turn off the starvation protection mechanism (SPM). Apparently, SPM gets turned on anytime you let more than 3 hours pass between eating episodes. When this happens, your body conserves fat and burns muscles! Why is this bad? Because muscles are the very tissues that help you burn calories even during rest time (called the resting metabolism). And trust me, your body looks more sculpted and better/leaner when you have more muscle mass. I am not talking about bulky muscles like the body builders you see on TV, I am talking about being toned and having a great body outline and form. I do resistance training to tone and build muscles, more on that in another post. This is especially beneficial for women as it not only helps to build muscles, but also increase bone density. For women, this will reduce the risks of osteoporosis or delay it’s onset. And for the generally small-framed Asian women, this is particularly critical for upkeep of our body posture and overall health. So if you keep losing your muscle mass due to SPM, then your metabolic rate goes downhill, and more fat tissues get stored up … a Vicious cycle develops! Double Whammy! The key to Jorge’s plan is TIMING. He found that the times that people ate their meals were crucial as it impacted what called the “starvation protection mechanism” – this mechanism determines if people maintain their lean muscle mass and their metabolism rate. The theory is: by eating frequent and controlled amount of food, Jorge promised that one can lose fat and gain muscles that will boost metabolism rates and a host of other benefits, including losing tummy fat!